Modularisation is the industry buzz-word, displacing ‘economies of scale’ that big LNG trains offered. Now it is extending to the storage tanks as well. Gulf of Mexico-based Commonwealth LNG is moving towards final investment decision on its planned liquefaction plant, but it has some procedural and financial hurdles to clear before it can proceed with its innovative engineering work. The project, on the west bank of the Calcasieu Ship Channel at the entrance to the Gulf of Mexico, will have 8.4mn mt/yr output capacity and is shooting for first deliveries in the first quarter of 2024. “Commonwealth LNG is focused on managing risk and lowering capital cost resulting in a platform that enables the competitive delivery of LNG to any market, under shorter and more flexible contract terms,” said CEO and founder Paul Varello. Not only are the liquefaction trains to be modular, as is the case with other projects such as Venture Global’s, in the same neighbourhood; but so too are the storage tanks, in an industry first, following an agreement with engineers Arup. The project is based on six trains each of 1.4mn mt/yr capacity; and six storage tanks, each of 40,000 m³. Last December, the company submitted its draft Resource Report 13 to the Federal Energy Regulatory Commission (Ferc). Ferc’s final acceptance of the application is expected in early April this year and will represent another important milestone in the company’s plan to start building its LNG facility. Commonwealth LNG senior vice-president for engineering, procurement and construction Rob Powers told NGW that the gas will be priced off Henry Hub, which provides “an exceptional source of physical liquidity. Feed gas will be sourced from several prolific basins, including the Haynesville, Cotton Valley/Austin Chalk, Tuscaloosa Marine, as well as the Marcellus and Utica.” The fee charged for liquefaction will be about $2.50/mn Btu, on top of whatever the Henry Hub price is for any given delivery period. He confirmed reported remarks made by Varello that the company has sold about 3-4mn mt/yr output under what are now just heads of agreement with European companies. Its aim is to secure such agreements for 8mn mt/yr, with the assumption that 6mn mt/yr will progress to full offtake agreements before it will take the final investment decision. Commonwealth has plenty of local competition, not to mention international competition: Global Venture is believed to be very close to FID and at time of press had just announced plans to double up, from 30mn mt/yr to 60mn mt/yr; Tellurian has a new idea offering equity; and ExxonMobil and Qatar Petroleum took final investment decision on Golden Pass in February. And already functioning is Cheniere’s Sabine Pass, with more trains at Corpus Christi on the way. 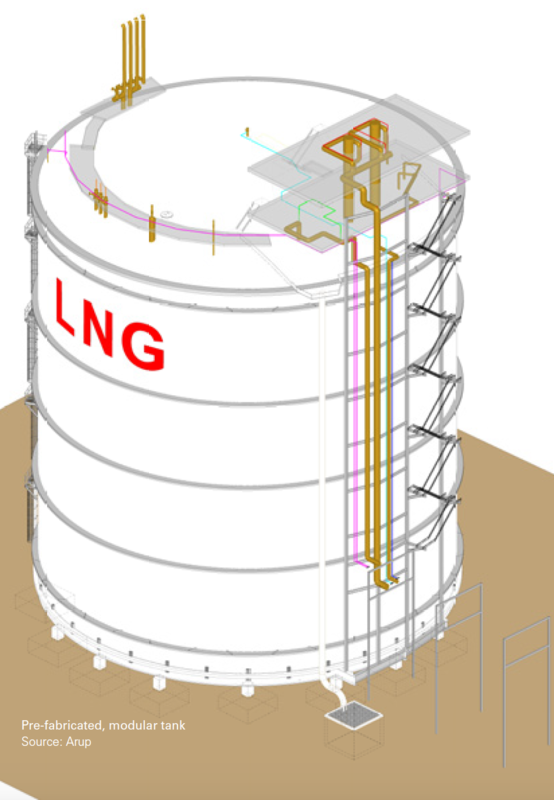 Arup is supporting Commonwealth LNG to obtain final approval from Ferc by providing structural, mechanical, and naval architecture engineering services in relation to the design of the modular storage tanks to be used at the facility. Arup is not a big name in the LNG world, but it told NGW that it was “increasingly being asked to do more commercial assessment within the LNG segment both from a consulting angle and also for transaction related projects.” This has included technical and commercial assessments of the small-scale LNG market in Europe; and developing an LNG terminal in Batangas, Philippines. Brian Raine, energy structures leader at Arup, talked NGW through the plan. He said that Arup had been working with Commonwealth LNG for some years and their philosophy is all about doing it pre-fab and assembling on site. But the intellectual property for the tank design remains with Arup, and nothing restricts it from participating in similar projects to Commonwealth LNG, he said. All major projects carry risk when establishing a brand-new facility. The developer is seeking an accessible and efficient site and assurance on the out-turn cost and schedule such that financing can be obtained and customer commitment secured. Sourcing a pre-fabricated solution would be a way to ensure greater reliability in the construction elements of the project that provides greater assurance to both the financiers and lenders, he said. By constructing at a factory, everything is to hand including skilled labour, with no permitting costs or time spent establishing a facility on site, and the factory can amortise the costs. LNG storage tanks at the liquefaction end of the chain come in small and large scale: either in the 100s of cubic metres or in the low 1,000s m³; or at major projects where they can be upwards of 150,000 m³, he said. These are for keeping the LNG ready to be offloaded into a tanker for delivery. Downstream, there is typically the same choice: for far-flung island communities, there is not necessarily the need for large import facilities; but smaller tanks may be required in order to keep some LNG on site, as back-up if there is a disruption to the schedule for deliveries, for some reason. A 100-MW power plant might need a 10,000 m³ tank for this purpose. The design is not new: Arup was looking at steel tanks of the 10,000-80,000 m³ size range, flat-bottomed cylinders which are about as high as they are wide – not the bullets which are horizontal cylinders with rounded ends. Its design takes the cylindrical flat-bottomed tank form with an inner and outer container. The annular gap between the inner container and the outer shell is insulated and the overall container sealed. The outer container can be made to contain LNG – this is known as the full containment system of LNG storage, he said. The inner container must be capable of contracting as it contains LNG at -165 °C, while the outer is exposed to the outer air. 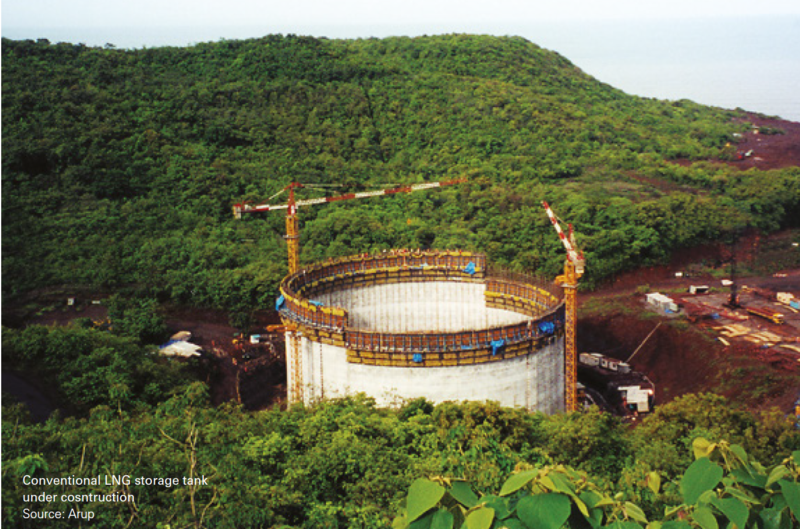 It is possible to construct these large tanks almost entirely offsite. Doing it remotely brings efficiencies but that presents challenges in transporting the tanks. As much as possible of the pre-fabrication work will be done off-site and that even includes pouring the concrete that is used in the containment system. Although it will make it heavier to transport, concrete made in the factory will be cheaper than anything that is mixed at the liquefaction site. Modularisation has become very popular, compared with onsite construction. First, there is the learning curve: the tenth tank made at a factory might take a fifth of the man-hours that the first tank required. That is a significant cost saving and means faster delivery. Arup can deliver these plants for Commonwealth a year earlier than if they were made on site. And generally the fewer people you have on site, the cheaper the construction is. That gives a schedule benefit and a labour benefit. Having six 40,000 m³ tanks does take up more land than two tanks of 120,000 m³, but land around Calcasieu Pass is undeveloped and inexpensive compared with other LNG sites. The tanks will be positioned at industry standard spacing. Before 2014, in the era of high oil demand, the marine engineers designed motorised vessels for heavy transport and doing the high value work in the Gulf of Mexico. Now that market has quietened down, the barges have more down-time and so the operators are looking for other kinds of business to keep busy. They can give us a good rate. The barges can carry up to 30,000 metric tons, whereas our tanks are only 3,000-5,000 mt, which is well below the maximum. Being motorised, the vessels are also manoeuvrable and given modern weather forecasting capacity, can choose the smoothest voyage. Or the construction schedule might allow us to avoid the hurricane season altogether. The tanks are subject to windage: being about 40 metres high by 50 metres across means they will act as a sail when at sea and be subject to other stresses as the barge crosses waves. So they will need to be fastened to the decks. But our marine insurers will have the restraints surveyed to make sure that the tanks are safe to transport. This has all been done before. It is all within the field of conventional naval architecture. The tanks will hold 40,000 m³ of LNG, which is a growing trend for the distributed LNG model as people want smaller capacities than the conventional-sized tanks, and made at our Ingleside factory in Texas, not far from Corpus Christi. It will take a couple of days to load each tank and then again to offload it at Calcasieu Pass and take it by heavy-duty trailer to the site, and it is about a three days’ sail.